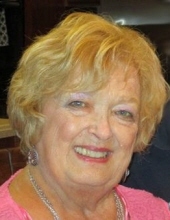 Audrey Violet Mullinnix (nee Schiller) entered into eternal rest on Jan. 18, 2019, surrounded by family at Baylor Hospital in Grapevine, TX. Visitation will be held on Friday, Jan. 25, 2-4 and 7-9 pm at Dooley Funeral Home, in Cranford, N.J. A Service will be Saturday, Jan. 26, at 9:30 am at St. Michael’s Church in Cranford, N.J. Interment in Fairview Cemetery, Westfield. Born in Elizabeth, NJ to the late Fred and Eleanor Schiller, Audrey was raised in Clark, NJ. She was predeceased by her parents and her beloved husband of 44 years, Robert L. Mullinnix, Jr. Audrey is survived by her loving daughters, Suzanne M. Mullinnix of Bradenton, FL and Jennifer L. Metter and her husband, Stan Metter of North Richland Hills, TX; the light of her life, grandson Nikolas R. Metter; her cherished sister, Ruth Silver and her husband Edward of North Myrtle Beach, SC; beloved mother-in-law Judy Tanner of Asheville, NC; loving sisters-in-law, Diana Webb and her husband Miles of Asheville, NC and Robin Lunsford and her husband Scott of Mars Hills, NC; a host of nieces and nephews, cousins and many friends. Audrey graduated from AL Johnson in Clark, NJ in 1963. Upon marrying the love of her life, Robert “Bob” in 1966, she worked at Honeywell while Bob attended college. While raising their children, Audrey worked at Samuel Lachs Law Firm as Office Manager for many years. Soon after, she returned to college, ultimately earning her Masters of Social Work degree in 2004. Audrey worked as a Social Worker focusing on children in need before retiring in 2009. After moving from her long-time home in Cranford, NJ, she spent time in North Myrtle Beach, SC; Monroe, NJ and most recently, in Southlake, TX. Aside from her family and career, perhaps Audrey’s greatest passion was singing tenor in Sweet Adeline International (SAI) for over 50 years. Audrey joined SAI at the age of 18 and was a member of several chapters, most recently Ramapo Valley and Harmony Celebration Chorus. She traveled the country, competing in SAI competitions, earning a Gold Medal by winning the International Chorus Competition in 1990. She and Bob, who was always at her side, made many lifelong friendships through Sweet Adelines. Receiving a kidney transplant in 1995, Audrey was a tireless patient advocate and served as President of the American Association of Kidney Patients. Throughout several medical complications, she always kept a positive outlook, living life to the fullest. Her strength, positivity, and perseverance were an inspiration to all that knew her and she will never be forgotten. Our lives will never be the same without her but the wonderful memories we have will comfort us. We take solace in knowing she is in Heaven with her cherished parents and husband. We will always love and miss you! To send flowers or a remembrance gift to the family of Audrey V. Mullinnix, please visit our Tribute Store. "Email Address" would like to share the life celebration of Audrey V. Mullinnix. Click on the "link" to go to share a favorite memory or leave a condolence message for the family.